Before the project was completed, Gould Court was a brick alleyway between Mitchell’s Ice Cream and Soho Kitchen & Bar. 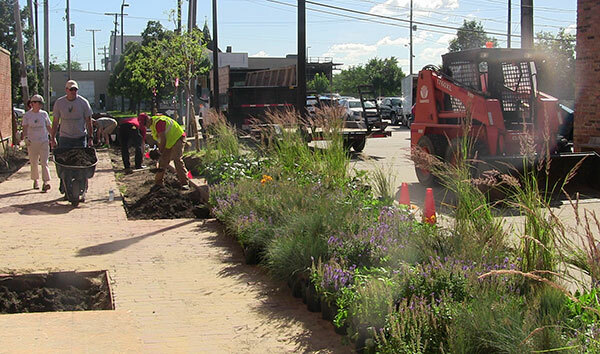 More than 400 ornamental grasses, annuals and perennials were donated for this project. 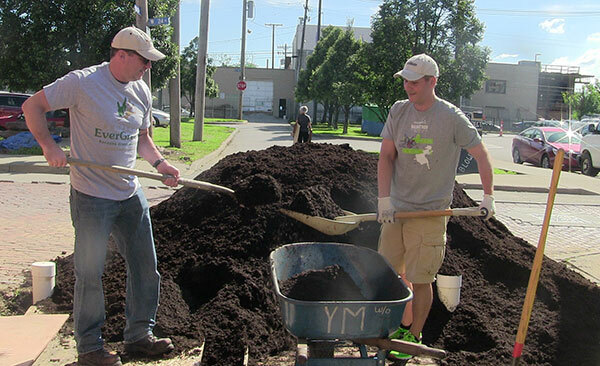 LM Publisher Bill Roddy and North American Sales Manager Craig MacGregor help transfer compost to the plant beds. This project took about 150 hours of work, said Kurt Kluznik, owner of Yardmaster (pictured above in red). A leaf statue will be installed in the center of this bed. “The project underscores the core objectives Project EverGreen stands for, which is to develop green spaces to help communities thrive,” said Cindy Code, executive director of Project EverGreen. About 10 volunteers and four employees from Yardmaster completed the project. Pictured above is the completed project, minus the seating area and statue. 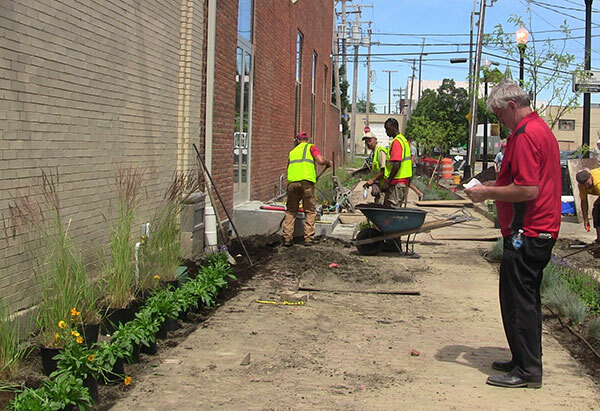 Project EverGreen, a Cleveland-based nonprofit, along with Painesville, Ohio-based Yardmaster and Cleveland-based Land Studio, revitalized an alleyway in Cleveland, June 24. Volunteers from Landscape Management and other industry members also participated. 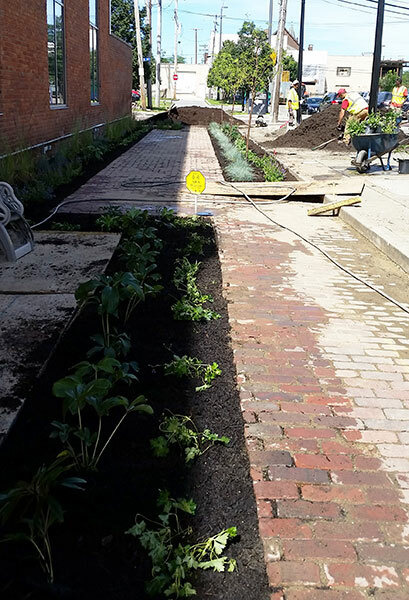 The area—Gould Court, located between Mitchell’s Ice Cream and Soho Kitchen & Bar in the Ohio City neighborhood—transformed from a bumpy brick alley to a green oasis for passersby and restaurant patrons to enjoy. 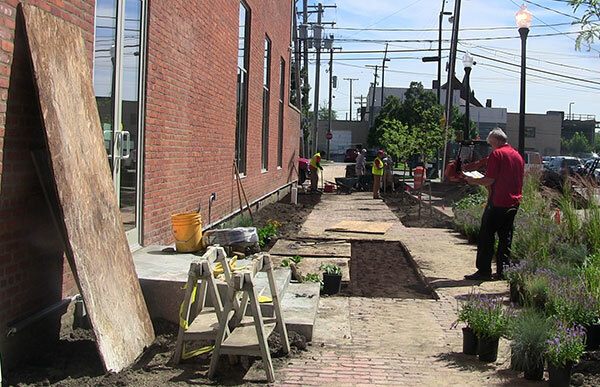 The project was led by Kurt Kluznik, president of Yardmaster, who’s also a landscape contractor and architect. 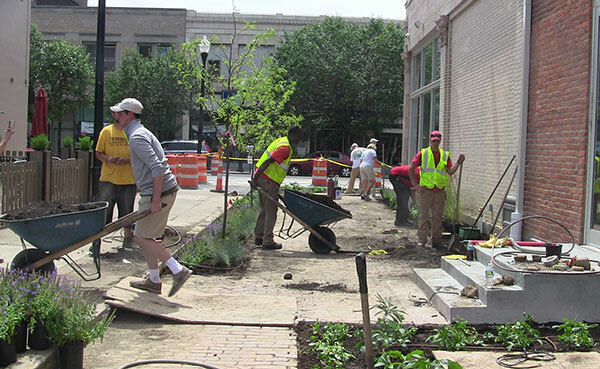 “It’s nice to do a project that converts a neglected space into an extremely usable space, and for people to be able to use and enjoy what you do,” said Kluznik. The project features a walkway and an underground cistern to collect rainwater that will be used to irrigate the landscape beds, which include a variety of trees, ornamental grasses, annuals and perennials. Soon, it will house a seating area and a sculpture. 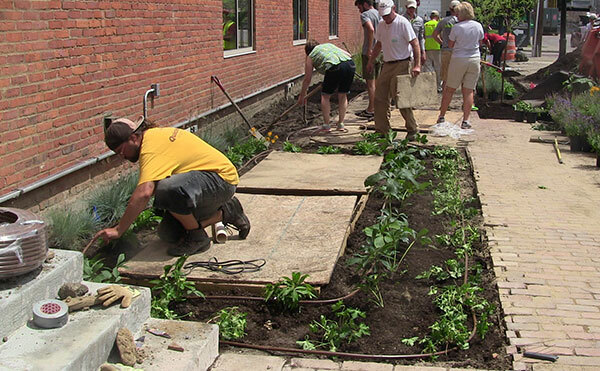 Land Studio coordinated the irrigation work, while about half the plants, top soil, mulch and compost were donated. The rest of the costs were covered by a private donor. 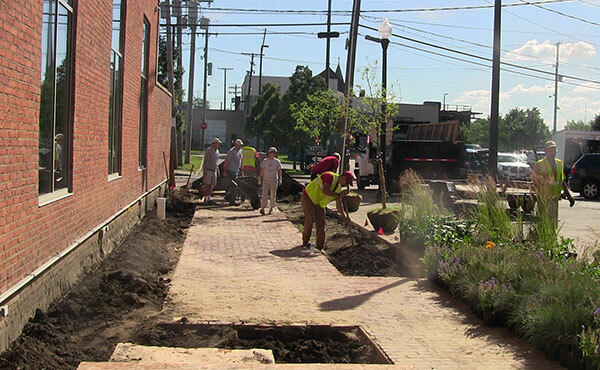 Local companies and organizations that contributed to the project include Yardmaster, North Coast Perennials, Klyn Nurseries, Gilson Gardens, Lake County Nursery, Kurtz Brothers, John Deere Landscapes, Sweet Peet, Land Studios and Mitchell’s Ice Cream.